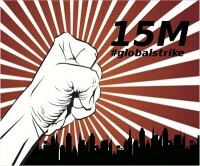 15M Global Strike – What is the plan? 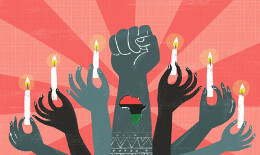 The Arab Spring was sparked by the first protests that occurred in Tunisia on 18 December 2010 following Mohamed Bouazizi‘s self-immolation in protest of police corruption and ill treatment. With the success of the protests in Tunisia, a wave of unrest sparked by the Tunisian “Burning Man” struck Algeria, Jordan, Egypt, Syria and Yemen, then spread to other Arab countries. Tunisian President Zine El Abidine Ben Ali fled to Saudi Arabia on 14 January following the Tunisian revolution protests. In Egypt, President Hosni Mubarak resigned on 11 February 2011 after 18 days of massive protests, ending his 30-year presidency. The Icelandic rejection of the debt and the Greek mobilizations against austerity plans, as well as the surge of new technologies with the uprising of movements such as Anonymous, Zeitgeist, Wikileaks, Democracy Now, Reopen911 or Yes men, amongst others, have also been of great influence to this (r)evolution. All through the winter of 2010 the collective “Democracia Real Ya!” (DRY), in association with approximately 200 smaller organizations, had been preparing a huge demonstration for real democracy in Spain. The protest movement gained momentum on May 15 with a camping occupation in Madrid’s main square, the Puerta del Sol, spreading to squares in 57 other major and smaller cities in Spain, and then to Spanish embassies all around the world. Via its Spanish server tomalaplaza and its international version Takethesquare, the re-baptized 15M movement (also called “indignados” by the media) became a transnational movement. It exploded in Greece ten days later (on May 25) and while taking place, with lesser intensity, in France, Italy, Portugal and Ireland with a culmination point on June 19 when “the outraged” took the street in hundreds of cities around the world in support of this first global day (3.000.000 just in Spain). In opposition to the Arab spring, 15M doesn’t fight towards ending a regime but has a holistic objective, it demands a Real Democracy, not just a revolution but an Evolution. The organization denounces the way big businesses and banks dominate the political and economical sphere and aims to propose a series of solutions to these problems through grassroots participatory democracy, which is based on people’s assemblies and consensus decision making. It maintains no affiliation with any political party or labor union and has not appointed any single leader and is unwilling to join any of the existing political bodies. It also promotes non-violent protesting. On mid June 2011, Takethesquare network and the international DRY platform started to work together on a global day for October 15 with a first objective of exporting the movement (assemblies and possibly camps) to a maximum of cities around the world. The first international meeting took place in Lisbon on the 10 and 11 of July with participants from Iceland, Greece, Spain, Italy, etc. Israel social justice protest rose up on July 14 with hundreds of thousands of people mobilized in the different protest camps all around the country. Around this time 8 marches began walking, from different areas of Spain, towards Madrid, starting people’s assemblies in every village they crossed, while organizing the second international meeting (a week-long social forum) which would be held on July 23 in their destination. After this, a new march left Madrid to walk to Brussels, and was quickly joined by six other European itinerant protests (coming from Barcelona, Saragossa, Toulouse, Sicily, Berlin and Amsterdam). They stopped in Paris on September 17 for the Global Anti-Bankster Day, (thought of as a means to test the international coordination before the 15O), when actions like the occupation of stock markets and central banks were taken against the financial dictatorship in a number of cities such as Barcelona, Athens, Tel Aviv, New York and Mexico; and the third international meeting (AgoraParis) was held. In September the first Hub meeting in Barcelona, took place. Hubs meetings are working areas focused on a concrete project but open to a maximum of collectives, this one in particular being focused on the coordination of the 15O Global Day. The fourth international meeting (AgoraBrussels) was held from the 8 of October until the 15O Global Day, when millions of people took to the streets in almost 1000 cities around the world, setting up General Assemblies and Occupations. Although incomparable in their intensity to Tunisia, Egypt, Spain, Greece and Israel, the actions of 15O still were present in all the continents and in 82 countries. 2.1 Who are we at a local and global level? a) Non-stop protests maintaining occupations, strikes, direct actions, information campaigns, day after day to apply real pressure on institutions (political, financial, military, environmental…) we want to reform or rebuild. b) Communities including camps, squats, itinerant walkers, neighborhoods, eco-villages, co-operatives and alternative projects… self-managed by what we all recognize as the only real democratic process (horizontal, open to everybody, non-partisan, transparent, non-violent, inclusive…) through the General Assembly. – “interested” people who will be present on the day of the action/activity or will profit from the service given by the group but who don’t have the time to participate to the work (and might be “focused” on another group). 2.2 What do we want at a local and global level? – The first and maybe only thing we all want is for power to be given back to the people, by joint-decision making. Because since the beginning of this movement we have always practiced and improved on this process, we now know what real democracy looks like and will only recognize a way of organization through self-management. As a movement, we want to expand this process to a maximum of places around the world (15O plan or geographic expansion), creating and connecting a maximum of communities that work with it. – We all agree that our methodology of assembly/consensus is the way to organize our communities and all the institutions that rule our lives (political, economical, educational, environmental…). Although there is a group who want to reform these institutions and make them adopt our process and another group who wish to create their own institutions from scratch, all the members of our movement want and recognize the same process (15M plan or systematic expansion). 2.3 What are our next concrete objectives at a local and global level? A first phase of local convergence of struggles or “outreach” missions, (will) give way to the coordination of fights towards a sustained and general action which can be global. Therefore, our direct action groups must firstly generalize the actions and, in collaboration with outreach groups, give a maximum of different sectors of the population (farmers, students, immigrants, workers, retired…) the tools to coordinate direct actions. A first phase of linking/supporting/creating local co-operatives (will) give way to the coordination of those alternative projects in holistic co-operatives which can, in turn, be global or regional. Because it will be the working groups that do the concrete tasks of this project and not the assemblies or the communities, we have to divide the work in 4 steps which represent each of the elements of a working group. And because we need responsible people to ensure the objectives are met, we always start with the focused people. 3.1 Focused people, from the global to the local agenda. The first phase of the plan takes place from the present moment until AgoraRoma 14-18 of January. These people should meet with at least once a week until the end of the second phase. The sophisticated project must be available in twenty days in as many languages as possible. The second phase of this project will last from AgoraRoma until the Hub Meeting of Bologna in March during the European action week. Direct Action: rural and student fights, industrial strikes, involve pensioners and public sector, etc. Economic Alternatives: producer networks, exchange systems, banks of time, link co-operatives, etc. Outreach: to neighborhoods, foreigner communities, artist collectives, etc. The second Hub Meeting will take place in Bologna and will focus on the coordination of the 15M Global Strike. While AgoraRoma will open the theoretical debate, the main goal of the Hub meeting will be the practical coordination of transnational actions and co-operatives around May 15. This third phase will start from the Hub Meeting until May 1st, with the help of #Akropolis2012 (April 1 to 15), where a lot of alternative projects and topics will be presented and debated to learn from each other and draw inspiration from other movements. In this phase, the working groups work on linking concrete alternative projects into holistic co-operatives and concrete actions into general non-stop protests, involving the “occasional” people. It’s an interesting phase because we can’t foresee the local or global situations but if we do our best, we will have, for the first time, concrete weapons against the 1% and concrete solutions for the 99%. May of 2012 will bring with it big changes, the global movement will start to be increasingly coherent, and represent a real alternative. It will became dangerous to the old system and attractive for a big part of the population. This last phase will start the May 1st on the international May Day, and and will last indefinitely. To integrate the interested people and catch the attention of the non-interested, it will be divided in four steps. Note: all the information presented on this document has been taken from the current global agenda and of course everyone is free to create more meetings and actions locally and to rise them to a global level. May 1: General Assembly / Unite! The major unions and political parties will meet during the morning and we cannot disturb this traditional ritual (partisan, vertical, opaque…), but we cannot miss this opportunity to give back this symbolic day to the 99%, making everybody converge in a big consensus meeting about the next days of action. Therefore, part of our strategy will be to call to the General Assembly of the 99% (horizontal, transparent, open…) at the end of the day to decide on how we will continue the fight together. We will surely have a lot of support (especially from the anarchists and radical left unions), since the main announcement about the local/global plan for the 15M Global Strike is what everyone will be waiting for, and this will send a strong message to the traditional organizations: “support either the politician’s gathering or the people’s assembly“. May 5: General Bank Transfer / Move Your Money! To continue and dynamize this non-stop protest, the proposal is to start an international campaign for everybody to take their money out of the commercial banks and transfer it to ethic banks (bank account), credit unions (savings), or invest it in ethic or alternative economies, or build their own financial institution, we can also promote the strike fund. This action will be coordinated not only by the “economic alternatives” working group, but also “communication” and “direct action”. There will be two fronts: firstly, taking the money out of the bankers’ elites, and secondly, making more money available to sustainable projects which will contribute to everyone’s interest and help to heal the world. It will consist on a big information campaign, through texts, videos, conferences, actions, to denounce what traditional banks are doing with our money but also promote the financial alternatives and the projects they finance. We invite all the communities to open the debate locally, to share this materials and create new ones adapted to their local situations. May 12: General Occupation / Act! Because not everybody is able to strike, people have added the 12 of May to the next global day of action, meant for both strikers and supporters. The global movement will re-take the central squares, which is the best way to mobilize massively for the big Transition, and open platforms of coordination of fights and cooperatives. Because we need maximum participation during the demonstration and the General Assembly to ensure a good occupation of the squares, it’s best to support it fully and perform all other occupations during the night, or previous or following days. May 15: General Strike / Strike! The most strategic, democratic and practical choice is to decentralize the actions, by inviting a maximum amount of sectors of the population to strike and create their own direct actions and with their own demands (both of which can be included as part of bigger, [more] general actions or statements). Every group of strikers will evaluate the duration of their actions and it’s important that they all have their voice during the GA’s from this day onwards, thus opening a big platform of struggles, both local and global, and inviting people to support other actions and demands. Another option is to write a statement of shared local and/or global demand(s) or point(s) in common (such referendums, reforms of the democracy, the right to protest, etc) over the next five months. The GA of May 1st can be a good occasion to build a consensus on the final draft. We cannot impose any action or political content for the Global Strike but we can propose a global demand from an international working group to all the assemblies. Regarding the aim(s) of our movement (a movement of methodology before ideologies), if we were to make one single demand, it could be the sovereignty of the assemblies, our vision of the real democracy. This is very interesting, because we will invite, for example, the citizens in their squares and the workers in their factories to reclaim the sovereignty of their own assemblies as part of their occupation. Both options are compatible, but, while it’s necessary to intensify the non-stop coordinated actions on one hand, we’ve learned that we also have to promote the co-operative projects on the other. Alternative projects include anti-authoritarian schools, people’s kitchens, kitchen gardens, credit unions, assemblies, self-managed factories, free shops and services, alternative media, etc., obviously working with our horizontal and transparent methodology. Even such a traditional concept of Strike is being reinvented by our global movement, transformed into Transition Strike, Wikistrike or Strike 2.0, in which the workers/consumers who helped maintain the system stop to do so and apply their energies to alternative projects in a permanent flow or exodus towards the future. On the agenda: expropriate public spaces (universities, hospitals, parliaments, squares…), means of production, natural resources, free energy, mass-media, etc., while we continue to create new projects and improve on the existing ones, in order to start and prolong this process of global change. The 15M isn’t the end, but the beginning of the transition.